It's been a while since my last post. I was feeling very guilty about it but I had good reasons for leaving you for so long. School let out on June 1st and since then we've been getting into our summer routine and when that routine includes 2-3 hours a day at the pool plus trips to the zoo, the library and other assorted kid spots it kinda cuts into available blog and project time. Anyways, I did use my limited spare time to whip up my first quilt!!! I am very excited about it and it finally arrived to my sister yesterday so now I can share with you all. My younger sister and her husband (see their guest post here) are expecting their first baby next month. I thought this was the perfect time to try my hand at quilting especially after I found the perfect fabric online. It is Mod Tod by Riley Blake designs. 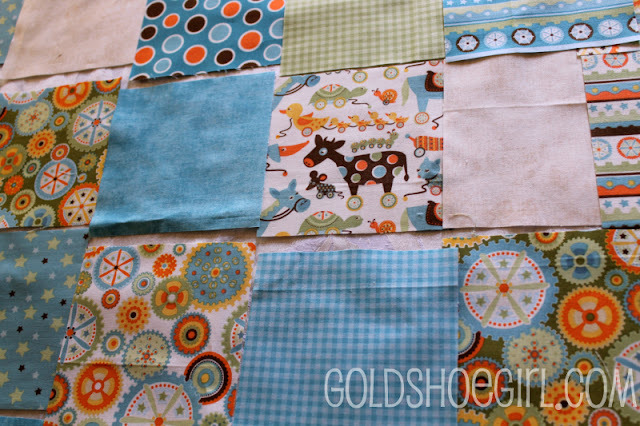 The picture shows a close-up of my patchwork squares all laid out. 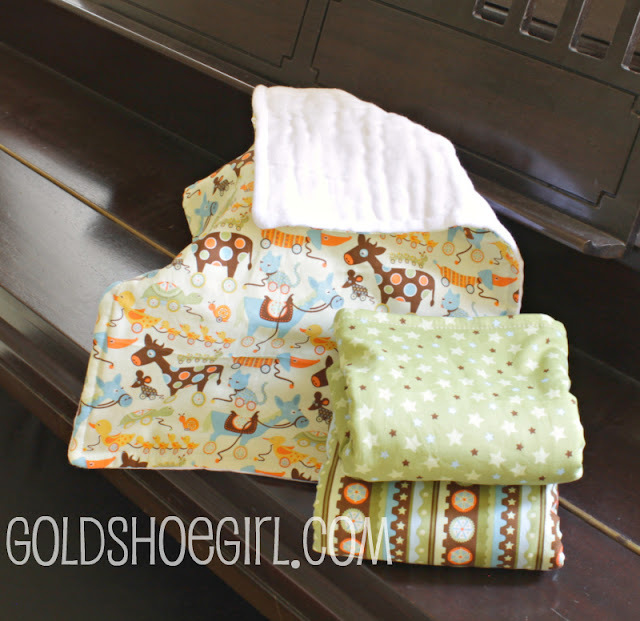 I bought a fat quarter bundle and had plenty for the blanket, the pillow, and the burp cloths. I even have another project lined up for the remaining fat quarters. I have to give a quick shout out to Amy Smart at Diary of a Quilter. I used her tutorial series on her blog to get me through the blanket. 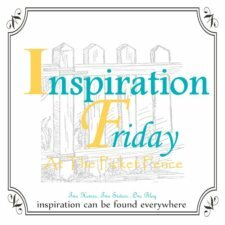 Her pictures are great and she explains everything so well that you can't help but have a great result. I was also inspired by my Aunt Alice who is a fantastic quilt maker and has always made beautiful quilts. I can remember going to her house as a kid and seeing all her fabrics and machines and being so in awe of how she made such amazing things with it all. I can't wait for her to see my first quilt. I started with the quilt which I made somewhat large at 40" x 60" because at that size it transitions well for a toddler bed too. The quilt was so quick & easy I couldn't believe it. What had been holding me back all these years!?!?! 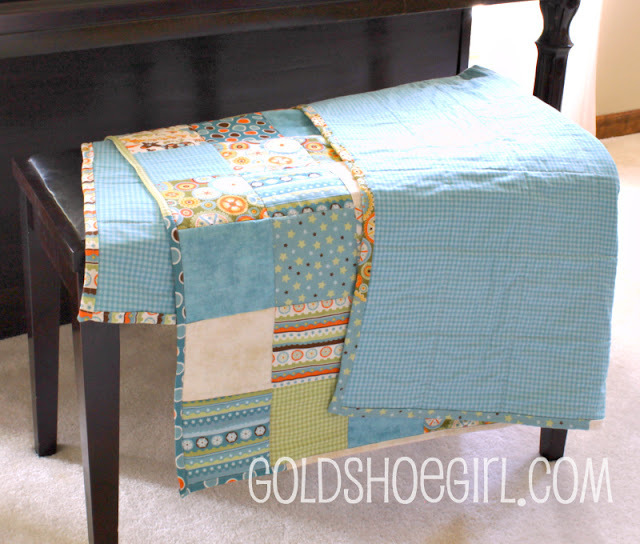 I did a simple stitch-in-the-ditch method for the quilting and used my scraps to make a piece-work binding. The backing is a whole piece of the blue gingham. 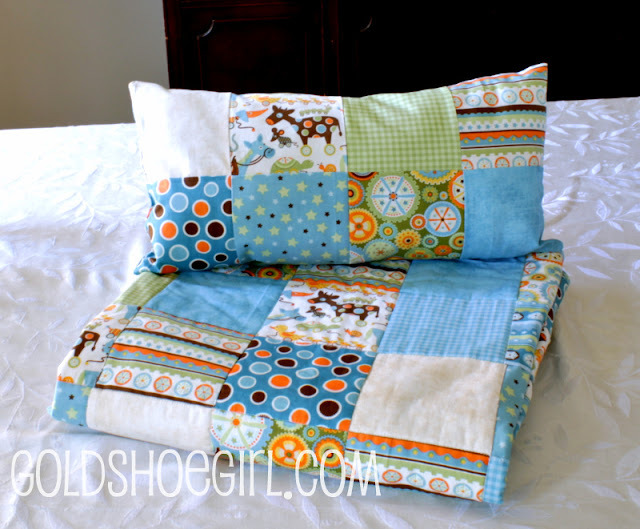 Then I used some of my extra squares to make the pillow. 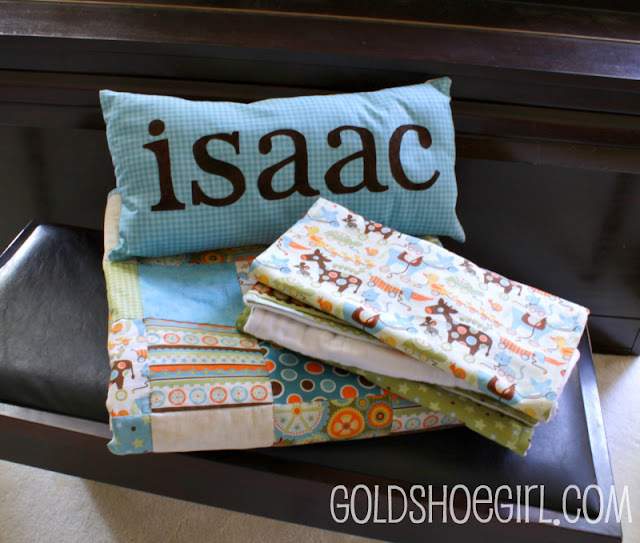 I did patchwork squares on one side and appliqued baby's name on the other side. For the burp cloths I bought a package of Gerber cloth diapers at Target and stitched a piece of fabric to it. They really are the simplest things ever to make. I can't believe the prices that people charge for them on etsy. Even my husband was impressed with my new found talents and my daughter asked when she is getting a quilt of her own. My boys' reaction was "That's nice. When are we going to the pool?". While I was waiting for the gifts to arrive to my sister I was able to finish another quilt which I will show you soon. Of course, I have not finished painting the kitchen cabinets:). 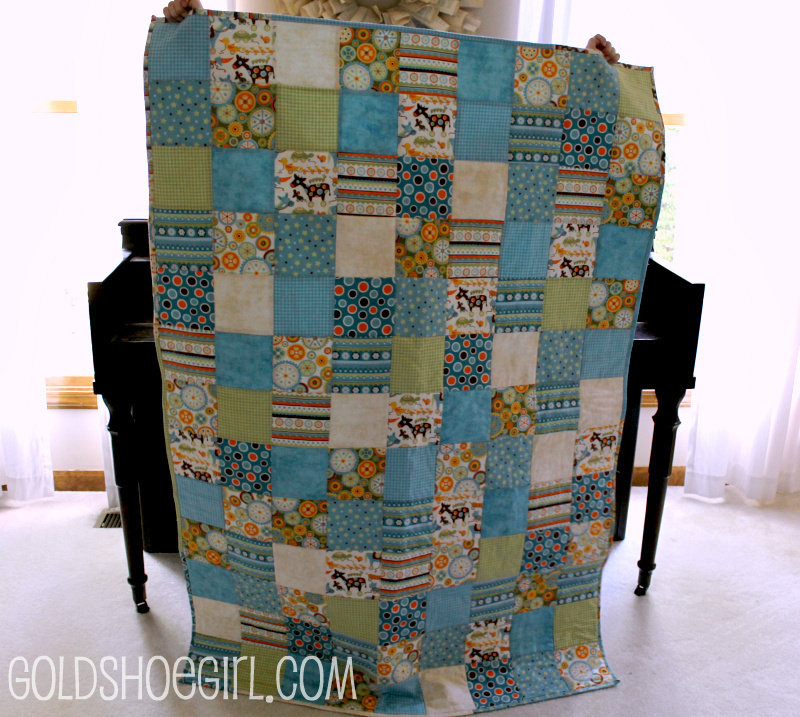 What a darling quilt!! You did such a great job. I love the colors and fabrics. I'm so glad that the tutorial was helpful! THanks so much for the shout out! I love your quilt..I have made quilts for my grandsons and have another one's fabric on my cutting table....your pictures inspire me..
What a wonderful gift for your little sister! I'm so very impressed that this is your first-ever quilt ... and I just adore the fabric!